A 5.2-mile border fence recently constructed along Organ Pipe Cactus National Monument's southern border in southwestern Arizona became a dam in a recent flash flood, monument officials say. Organ Pipe officials issued a 17-page report this week detailing how the 15-foot-high wire mesh fence halted the natural flow of floodwater during a July 12 storm that dumped 1 to 2 inches of rain in 90 minutes around the border towns of Lukeville, Ariz., and Sonoyta, Sonora. Debris piled up against the fence, including in drainage gates designed to prevent flooding, and the 6-foot deep fence foundation stopped subsurface water flow, the report said. As a result, water pooled 2 to 7 feet high, depending on the area, causing water that usually flows north to south across the border in natural drainage washes to flow laterally, the report said. 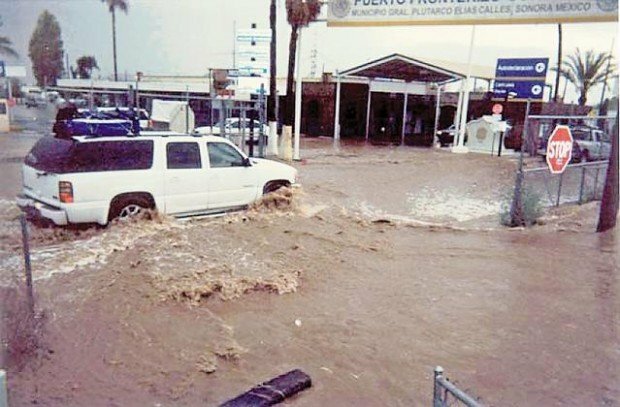 A wash directly west of Lukeville flowed more than 200 feet along the fence and through the port of entry at the international border, causing flood damage to private property, government offices and businesses in Lukeville and Sonoyta, the report said. Simply put: The fence did not live up to promises made by officials from the U.S. Army Corps of Engineers, the U.S. Border Patrol or Kiewit Western Co., the private company that built the fence for $21.3 million, the report said. "As a consequence, natural resources of Organ Pipe Cactus National Monument and National Park Service infrastructure will be impacted, as well as resources and infrastructure on neighboring lands in the U.S. and Mexico," the report said. The report has been sent to the Border Patrol and its parent agency, the Department of Homeland Security, said Lee Baiza, Organ Pipe Cactus National Monument superintendent. "I would just like to have them come back and re-evaluate the structure," Baiza said. "They need to come up with a process to be able to remove the debris prior to reaching the fence or the alter the design of the fence to accommodate more flow." The Corps of Engineers, in cooperation with Homeland Security, designed the fence. In washes, the fence has grate openings at the bottom that are 6 inches high and 24 inches wide with 1-by-3-inch bars. The grates are designed to accommodate a flood, the report said. Nearly all of the 5.2-mile fence, which flanks Lukeville, was completed this summer, Baiza said. Kiewit is working to finish a small section that goes up and over a steep hill west of Lukeville, he said. U.S. Customs and Border Protection officials had not yet seen the report and declined to comment, said spokesman Barry Morrissey, based in Washington, D.C.
A Kiewit spokesman said his company couldn't comment on the report without authorization from the Corps of Engineers. Kiewit, based in Omaha, Neb., has also been awarded a $16.6 million contract to build 6.24 miles of fencing west of the San Pedro River in Cochise County, figures from the Corps of Engineers show. That occurred the same day as the flooding on Organ Pipe: July 12. Environmentalists say they have been warning about such problems with the border fences since plans came out. "What we are seeing graphically at Organ Pipe was predictable — this is what happens when you circumvent environmental laws," said Robin Silver, co-founder and board member of the Center for Biological Diversity. "When you build an impediment across a stream, it becomes a dam. And providing some holes in a fence is a joke." The impediment to the flow of water can accelerate erosion, wipe out riparian vegetation and potentially cause lateral shifts in the locations of riverbeds, said Matt Clark, southwest representative of Defenders of Wildlife. The diverted water flows can cause damage to people and man-made structures nearby, too. "Whatever is in the path of the redirected water flow will be damaged, whether that's vegetation and natural resources or man-made structures," Clark said. "The power of water is a major force." The furious pace at which Homeland Security officials have been working to install 670 miles of primary fencing and vehicle barriers by the end of the year to meet mandates resulted in a lack of diligence on such issues as water flow, Clark said. "It's something that has been anticipated and unfortunately has apparently been ignored in the rush to build this wall," Clark said. Though Baiza declined to join the chorus of "I told you so," the report shows that he and other Organ Pipe officials also warned Homeland Security about water-flow issues before construction began. In October 2007, Organ Pipe officials told Homeland Security they were worried that the fence would impede the movement of floodwater across the border; that debris would get trapped in the fence; that backwater would pool up; and that the lateral flow of water would cause damage to the environment and patrol roads, the report said. In response to those concerns, the Border Patrol issued a final environmental assessment with a finding of no significant impact that said the fence would not impede the natural flow of water or cause flooding, the report said. The agency said it would remove debris from the fence within the washes and arroyos immediately after rains to ensure no flooding occurred. At a December 2007 meeting, Kiewit officials stated in a handout that the fence design "would permit water and debris to flow freely and not allow ponding of water on either side of the border" because the drainage crossing grates "met hydraulic modeling requirements." Baiza didn't place blame but said he wants to make sure something is done. "We're trying to be constructive with this report, and the main thing is that I just don't want it to be forgotten or undone," Baiza said. "I want to make sure we address situations as they occur." Organ Pipe officials have concerns about it happening again. Based on a 60-year record of daily rainfall at Organ Pipe, the amount of rain that fell July 12 occurs once every three years, the report said. "It would like putting your finger on the end of the water hose," Baiza said. "You are restricting the water flow; that is what the fence is doing." "What we are seeing graphically at Organ Pipe was predictable — this is what happens when you circumvent environmental laws." ● Contact reporter Brady McCombs at 573-4213 or bmccombs@azstarnet.com. A 40-foot stretch of mesh border fence east of Lukeville in Southwestern Arizona was knocked over Sunday by rainwater rushing through a wash. This is the first time any part of this 5.2-mile stretch of fence has been knocked down by floodwaters since it was built in 2007-2008.